It's all in your mind ... yet you "feel" it emotionally and physically. Everything is in your mind as we exist in the virtual reality simulation or hologram. You believe things are real because your brain tells you they'll get the brain is nothing more than an electrochemical machine programmed for you to experience a wide gamut of emotions in your "time" here. Most people experience some degree of anxiety during their lives, some on a daily basis. It may be once, or something ongoing - part of their program patterning, but once experienced they remember its effects forever. The object is not to make it a conditioned response. Human programming is about emotions - both positive and negative - but mostly the study of negative emotions and how they affect us physically and spiritually. Reality is set in linear time to this end. In the Age of Healing and Awareness, the most discussed emotions are fear, anxiety, panic, and stress, linked with an endless array of personality disorders. They immobilize and destroy us - as we try to make sense of what's going on around us both from our childhood and currently. Anxiety sets people on a quest to find out what is wrong with them, as it symptoms cannot be ignored. Humans are very good at ignoring things unless they are forced to deal with them. Most people deal with anxiety with prescription medication or as with many other mental illnesses - where people refuse to get professional help - they deal with anxiety by using alcohol or recreational drugs. Anxiety is an offshoot of the strongest emotion - FEAR. With early conditioning we become anxious about Ð failures and successes - and those that judge us. Anxiety is often accompanied by physical sensations such as heart palpitations, nausea, chest pain, shortness of breath, or tension headache. Externally, somatic signs of anxiety may include pale skin, sweating, trembling, and pupillary dilation. It would seem the levels of these emotions are on the increase based on evolving society and environment. Humans are currently trying to figure out who they are, what is their purpose for being here, where they came from, and what the future holds, as many people feel that life on planet earth as we know it, will no longer be sustainable in the near future. As with all other emotional problems, anxiety has many levels and dimensions, the wiring in the brain affecting behavior. Anxiety, panic attack and fear are daily issues many people face. Anxiety is a psychological and physiological state characterized by somatic, emotional, cognitive, and behavioral components. The root meaning of the word anxiety is to vex or trouble; in either the absence or presence of psychological stress, anxiety can create feelings of fear, worry, uneasiness and dread. Anxiety is considered to be a normal reaction to stress. It may help a person to deal with a difficult situation by prompting one to cope with it. 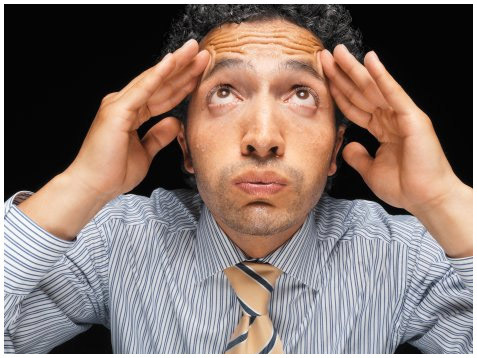 When anxiety becomes excessive, it may fall under the classification of an anxiety disorder. This is an old pattern and part of the dynamic of the "evolving human". The nature of the programming of our reality is a never ending quest to create balance in our lives only to discover that we live in a virtual reality simulation whose programming it is to study emotions - mostly of the negative type. Will we ever overcome anxiety as a species? Is doubtful because it's built into our programming. The best we can hope to do is find ways to understand ... what causes anxiety, that it's part of our DNA code, how we can change our life patterns, and how we can create some sort of balance in our lives. To this end people do yoga, meditation, Pilates, and any other form of exercise that balance the chemistry - or wiring - of the brain. Anxiety is an unpleasant state of inner turmoil, often accompanied by nervous behavior, such as pacing back and forth, somatic complaints and rumination. It is the subjectively unpleasant feelings of dread over anticipated events, such as the feeling of imminent death. Anxiety is not the same as fear, which is a response to a real or perceived immediate threat; whereas anxiety is the expectation of future threat. Anxiety is a feeling of fear, worry, and uneasiness, usually generalized and unfocused as an overreaction to a situation that is only subjectively seen as menacing. It is often accompanied by muscular tension, restlessness, fatigue and problems in concentration. Anxiety can be appropriate, but when experienced regularly the individual may suffer from an anxiety disorder. 1. 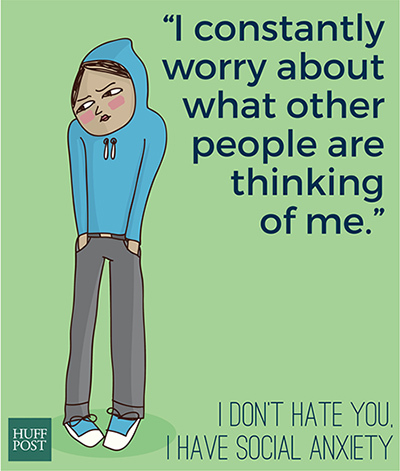 I constantly worry about what other people are thinking of me. 2. I second guess most of what I say, causing long pauses in conversations, fumbling over my words, and a generally quiet and shy nature. 3. I get anxious before social events with people I don't know, occasionally to the point of nausea and headaches. Sometimes it's a battle just to get myself to leave the house, my mind full of concerns about what might happen, who I might meet, and what I might say or do wrong. One of the largest misconceptions about anxiety is that the disorder is something people "bring upon themselves," a concept that is as malignant as it is incorrect. Adding to the evidence against this isolating stereotype, a new study from the University of Wisconsin, Madison found that the brain function that underlies anxiety and depression may be inherited. The disorder, which touches 18 percent of American adults, is one of the most common mental health issues in the world. It can affect your teachers, your loved ones, your baristas or your neighbors. But its prevalence isn't all there is to know about the mental health disorder. 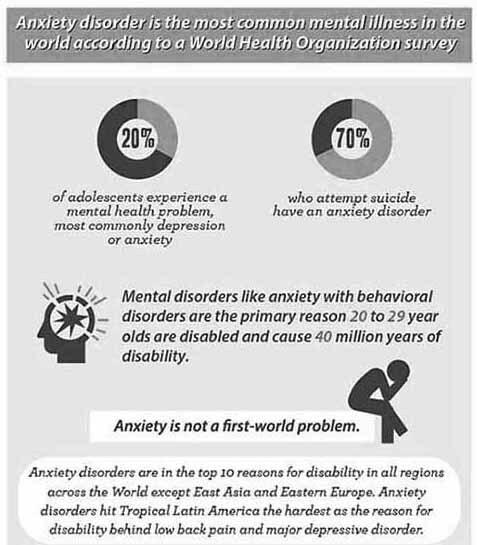 Take a look at the infographic below, which shows just how many ways anxiety can affect someone's life. If the facts prove anything, it's that anxiety sufferers are certainly not alone. When things get unpredictable, people prone to high anxiety may have a harder time reading the environmental cues that could help them avoid a bad outcome. A new study hints at a glitch in the brainÕs higher-order decision-making circuitry that could eventually be a target in the treatment of anxiety disorders, which affect some 40 million American adults. Below find five supportive ways to help someone cope with anxiety. "Can you tell me more about your experience?" "I'm sorry you're going through that." "This is not your fault." "That must be really hard for you." PeoplesÕ woes seem to vary by day of the week, too. Wednesdays are for anxiety, while suicidal thoughts peak on Sundays. Geographically, New England seems to be the hub of anxiety, while depression is more evenly distributed throughout the country. If you've ever suffered from severe anxiety, you're probably overly familiar with the control it can have over your life. And you're not alone -- it affects approximately 40 million adult Americans per year. 1. "Don't sweat the small stuff." 4. "Everything is going to be fine." 5. "I'm stressed out too." 6. "Have a drink -- it'll take your mind off of it." 7. "Did I do something wrong?"